A magical unicorn is detailed in super bright neon flex to make a striking room light! 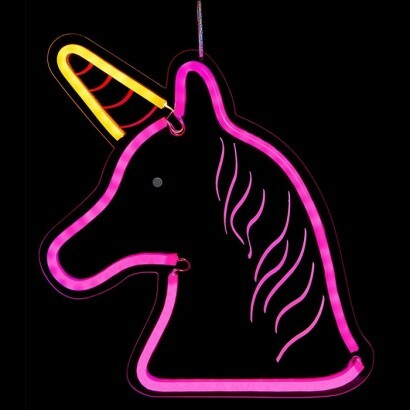 Outlined in vibrant pink neon flex with a yellow horn, this enchanting unicorn light makes a huge impact with super bright colour! Formed with LED neon flex that's designed to mimic the retro neon signs of the past, this striking unicorn makes a stunning night light adding colour and light to your space. Backed onto clear perspex, the unicorn's form appears to float freely when lit making the dark a more magical place. Mains operated with clear cable, there's a silver cord for easy placement.